This low-growing member of the stonecrop family is an evergreen, although in dry conditions its only colours are red and yellow!. 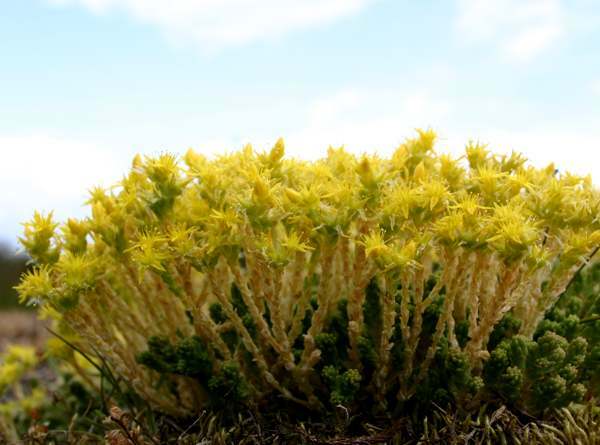 With creeping stems throwing up densely-packed flowering stems interspersed withy non-flowering stems, Biting Stonecrop creates a dense mat up to 10cm tall. Fleshy elongated egg-shaped leaves alternate up the stems, with reddish tinges to the upper leaves especially of non-flowering stems. 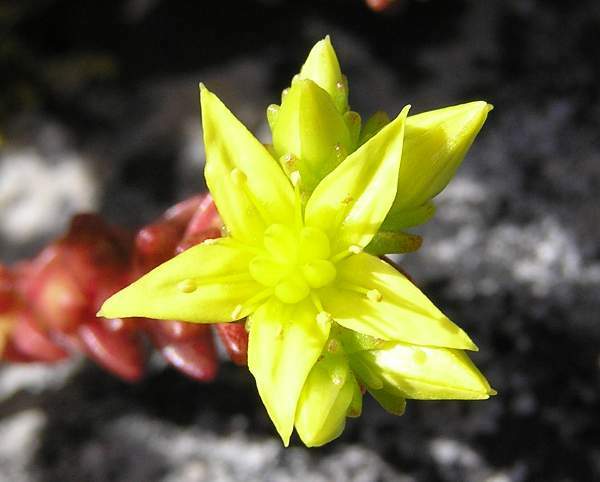 Flowers of Biting Stonecrop have five bright sulphur yellow pointed petals and are 10 to 14mm across. Biting Stonecrop is common and widespread throughout Britain and Ireland; this drought-tolerant plant is native to Europe and has been introduced to many other parts of the temperate world including North America and Australia. Sedum acre favours dry, rocky places such as stone walls (one of its common names is Wall-pepper) and pavement edges. 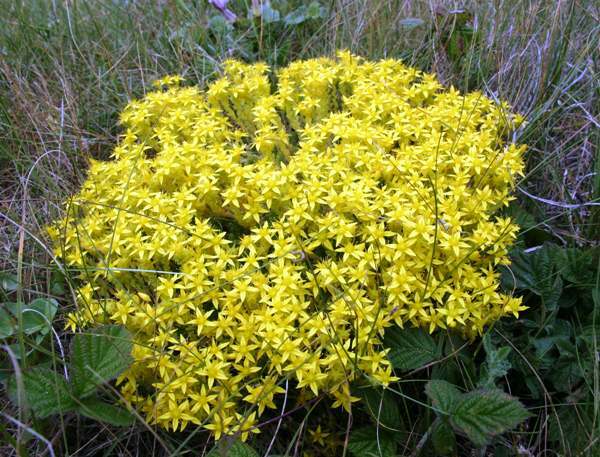 This is also a plant of sandy soils, thriving on coastal sand dunes and sometimes also in the shingle along shorelines. Biting Stonecrop can also colonise the lichen-covered joints and crevices on old tiled roofs, and in the past it was even planted on roofs in the belief that it had magical powers to deflect lightning. In Britain and Ireland the flowers of Biting Stonecrop appear in June and July. In the past this wildflower was used medically to treat nosebleeds, ulcers and a variety of other ailments; however, this acrid-tasting herb can cause rather than cure sickness, as eaten in anything but small amounts it can result in vomiting. Sedum, the genus name, comes from the same Latin root a sedentary, meaning sitting down; it is a reference to the ground-hugging stature of stonecrops, including this one. The leaves have a sharp peppery taste, from which Biting Stonecrop gets its specific epithet acre, meaning sharp (in the sense of acrid!). Similar in size and general structure but with smaller leaves than Biting Stonecrop, English Stonecrop has white and pink flowers and is often found on coastal cliff tops as well as on drystone walls and scree. 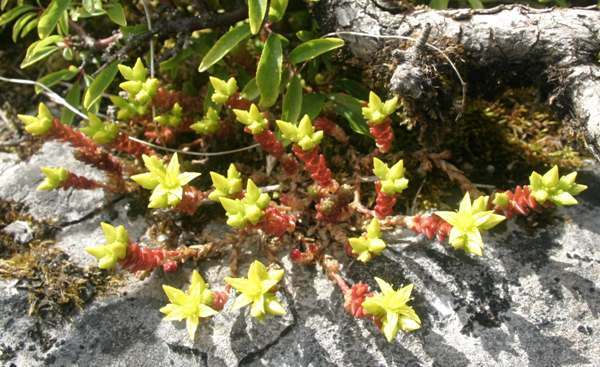 The pictures of Biting Stonecrop shown on this page was taken in the Burren Ireland and at Newborough Warren National Nature Reserve in Anglesey, North Wales during June.